The “witching hour” is almost upon us, time to wish all our customers and readers a happy Halloween. “All Hallows Eve” is a time traditionally linked with monsters and demons and the fossil record is crammed full of very scary looking invertebrates and vertebrate specimens that would have been very much at home in the cast of a horror movie. In April 2011, a scientific paper was published announcing the formal scientific description of a demonic-looking dinosaur. A fearsome, little meat-eater that would have terrorised New Mexico in the Late Triassic. The dinosaur was named Daemonosaurus chauliodus and the name translates as “buck-toothed evil spirit”. Although small compared to some of its later descendants, (D. chauliodus measured less than two metres long), it had a deep skull and oversized teeth in the front of its jaws which gave this little Theropod a strong and nasty bite. The vicious-looking Late Triassic Theropod dinosaur Daemonosaurus chauliodus from New Mexico. A team of scientists based in France and Belgium have announced the discovery of a new species of pterosaur from Upper Cretaceous rocks in south-eastern France (Bouches-du-Rhône). The fragmentary bones have been assigned to the Azhdarchidae family of pterosaurs, one of the last groups of flying reptiles to exist and a family that contains giants such as Quetzalcoatlus and Hatzegopteryx. With a wingspan estimated to be around 4.5 metres, the specimen, believed to be a juvenile, provides evidence of a third azhdarchid pterosaur size class from the cluster of islands that represented continental Europe towards the end of the Mesozoic. The pterosaur has been named Mistralazhdarcho maggii pronounced (miss-tral-ads-dar-cho may-gee). An illustration of the newly described (2018) azhdarchid pterosaur from France Mistralazhdarcho maggii. Writing in the academic publication the “Journal of Vertebrate Paleontology”, the researchers describe the finding of part of a lower jaw, a neck bone and several other postcranial bones in 2009. The bones were found in association with each other and therefore, probably represent the fossilised remains of a single pterosaur. The material comes from the excavation site of Velaux, near Aix-en-Provence and from strata that dates to the Campanian faunal stage of the Late Cretaceous. Fossil material associated with the newly described French pterosaur Mistralazhdarcho maggii. The photograph (above), shows a part mandible (a) with a distinctive ridge (mandibular symphysis). A cervical vertebra (b), left humerus (c), left radius (d) and two bones from the hand – metacarpal IV (e) and a finger bone (f). Although the fossil material is fragmentary, such is the poor fossil record of Late Cretaceous pterosaurs from Europe that these few bones make Mistralazhdarcho one of the most complete European azhdarchids described to date. In addition, Mistralazhdarcho is the first partial skeleton of a flying reptile excavated from Upper Cretaceous deposits of western Europe. Related to a North African Pterosaur? The scientists, which included researchers from the University of Rennes, the Royal Belgian Institute for Natural Sciences and Poitiers University, conclude that Mistralazhdarcho was related to an earlier pterosaur called Alanqa (A. saharica), which lived in North Africa around 95 million years ago. When Alanqa was first described, back in 2010, it was assigned to the Azhdarchidae, but more recent studies incorporating skull material discovered in 2015, have cast doubt on the taxonomic position of Alanqa. Examination of the fossil bones suggest that they were not fully ossified and that this was a sub-adult. The researchers speculate that a fully-grown Mistralazhdarcho would have had a wingspan of around 5 to 6 metres, possibly even bigger. This size estimate is in between the size estimates given for the two azhdarchids from the Maastrichtian of Romania (Hateg Formation), which also represents the European Late Cretaceous archipelago environment. A comparison of European azhdarchid pterosaurs. Mistralazhdarcho is estimated to be intermediate in size between the medium-sized genus Eurazhdarcho (wingspan of 3 metres) and the enormous Hatzegopteryx (estimated wingspan of 10 metres or more), the two other azhdarchids associated with the island ecosystem of the latest Cretaceous European archipelago. The different sized pterosaurs might reflect a form of niche partitioning, whereby, different sized animals did not directly compete with each other for resources. The flying reptile’s genus name is from the “mistral”, a strong, north-westerly wind associated with southern France. The species name honours the former mayor of Velaux, Jean-Pierre Maggi, without whom, the excavation of the fossil material would not have been possible. Fossil excavation work at one of the dig sites at Velaux (south-eastern France). The scientific paper: “Mistralazhdarcho maggii, gen. et sp. nov., a New Azhdarchid Pterosaur from the Upper Cretaceous of south-eastern France” by Romain Vullo, Géraldine Garcia, Pascal Godefroit, Aude Cincotta and Xavier Valentin published in the Journal of Vertebrate Paleontology. Chinese scientists have published details of a new species of long-necked dinosaur from eastern China. The fossilised remains, although fragmentary, have permitted the researchers to confidently assign the specimen (AGB 5822), to the Mamenchisauridae family of Sauropods. The dinosaur has been named Anhuilong diboensis and it suggests that by the Middle Jurassic, mamenchisaurids were already a diverse family. It is likely that the sandstones and mudstones that form the majority of the fossil bearing, Middle Jurassic-aged strata near Huangshan (Anhui Province), will yield more dinosaur fossils. A typical member of the Mamenchisauridae family (Mamenchisaurus). The fossil material, consisting of the remains of a single forelimb, representing one individual dinosaur (humerus, ulna and radius bones), was distinct enough to permit the scientists, which included researchers from the Chinese Academy of Sciences and the Anhui Geological Museum, to establish a new genus. Anhuilong diboensis is the second mamenchisaurid to be identified from the Middle Jurassic Hongqin Formation of Shexian, Huangshan (Anhui Province, eastern China). The first mamenchisaurid from this locality, Huangshanlong anhuiensis, was named and described in 2014. The authors of the scientific paper describing A. diboensis were also responsible for the earlier study of H. anhuiensis. A phylogenetic analysis of the limb bones from these two specimens suggest that Anhuilong is the sister taxon of Huangshanlong and with Omeisaurus from Sichuan Province, they together form a sister clade to all other members of Mamenchisauridae. Huangshanlong anhuiensis – views of the humerus of a typical mamenchisaurid dinosaur. The picture above shows various views of the right humerus (upper arm bone) of H. anhuiensis. The morphology of limb bones and how they compare to each other (total length of the ulna to the humerus and the total length of the radius to the humerus), are distinct enough for palaeontologists to ascribe them to the Mamenchisauridae and to erect a new genus. A = humerus viewed from the front. B = humerus viewed from one side (medial view). C = humerus viewed from the back. D = humerus viewed from the other side (lateral view). F = view of a cross section, near the narrowest part of the bone. G = viewed from underneath (distal view). Until recently, palaeontologists had thought that although the Sauropoda were geographically widespread by the Middle Jurassic, sub-groups such as the Mamenchisauridae family and the Diplodocidae had restricted geographical ranges. However, earlier this year, a diplodocid dinosaur was described from northern China, proving that these long-necked dinosaurs were present in Asia during the Middle Jurassic. The fossil record for the Mamenchisauridae indicates that these types of Sauropods were restricted to China. Those very rare Archaeopteryx specimens that have been found in the fine-grained, Upper Jurassic deposits of Germany are some of the most intensely researched fossils on our planet. However, they can still surprise and it seems that we have much to learn about “Urvogel” as the Germans refer to this iconic transitional form between a dinosaur and a true bird. Writing in the academic journal “Historical Biology”, a team of international researchers have subjected one particular fossil (specimen number eight), to the powerful X-rays of synchrotron microtomography and discovered that this example of the “first bird” is so different from other Archaeopteryx fossils that it merits being categorised as a separate species. A life reconstruction of the newly described Archaeopteryx species (A. albersdoerferi). The scientists, which included researchers from Uppsala University, the Chinese Academy of Geological Sciences and Manchester University’s John Nudds (School of Earth and Environmental Sciences), carried out a three-dimensional analysis of the fossil using the European Synchrotron Radiation Facility (ESRF), located in Grenoble. The team found that specimen eight is closer to modern birds in evolutionary terms when compared to the other known Archaeopteryx specimens. Dr John Nudds (Manchester University) holding the Archaeopteryx specimen at the European Synchrotron facility (Grenoble, France). The research team identified numerous, subtle skeletal differences between this specimen and the other Archaeopteryx fossil skeletons. For example, specimen eight has fused cranial bones, a different pectoral girdle and wing elements and a more robust set of carpals and metacarpals (hand bones). The X-ray scans revealed that this specimen had very light bones, with numerous air sacs in them. These characteristics are observed more in modern flying (volant), birds and are not found in the older Archaeopteryx lithographica species. The fossil studied is the so-called Mörnsheim or Daiting specimen, from strata which is around half a million years younger than the rocks associated with the majority of the German Archaeopteryx fossils. As such, specimen eight is stratigraphically the youngest Bavarian archaeopterygid. The Mörnsheim or Daiting fossil has had a colourful history. It was (allegedly), discovered by a private fossil collector in a quarry near the town of Daiting in southern Bavaria, about twenty miles south of the city of Nuremberg (Germany), sometime in the early 1990’s. It was incorrectly identified as a Pterosaur and this fossil changed hands several times. Rumours began to circulate amongst the scientific community that there was another Archaeopteryx specimen but it remained elusive, so much so, that the fossil was nick-named “The Phantom”. A cast of the fossil was briefly put on display at the Naturkundemuseum in Bamberg (Germany) in 1996 and a short report was written a year later, but this specimen remained out of reach and not accessible for study. All this changed in 2009, when palaeontologist Raimund Albersdörfer of Schnaittach (Bavaria), purchased the specimen from a private collector and secured its scientific heritage by offering it on long-term loan to the Bavarian State Collection of Palaeontology and Geology in Munich, and obligated himself by contract not to sell the specimen to a non-public entity. The species name honours the contribution made by Raimund Albersdörfer. This is not the first time that Raimund has made a privately-owned Theropod specimen available to study. In 2012, he was honoured by having the trivial name of a feathered dinosaur from southern Germany named after him (Sciurumimus albersdoerferi). Is The Really a New Species? Palaeontologists are aware that this part of Germany where the Archaeopteryx fossil material comes from, was once a series of small islands surrounded by a tropical sea. The strata were laid down over hundreds of thousands of years and it is therefore quite possible that different species of primitive “dino-bird” evolved over this period. However, the Mörnsheim specimen was examined using computer tomography that provided an extremely detailed assessment of the fossil material. It is quite possible, that, if other Archaeopteryx specimens were subjected to the same level of scrutiny, then new information about them would be discovered too. The scientific paper: “The First Specimen of Archaeopteryx from the Upper Jurassic Mörnsheim Formation of Germany” by Martin Kundrát, John Nudds, Benjamin P. Kear, Junchang Lü and Per Ahlberg published in Historical Biology. Everything Dinosaur acknowledges the help of a press release from the University of Manchester in the compilation of this article. Pachycephalosaurus – Was It Carnivorous? Pachycephalosaurus, that dome-headed dinosaur that lived alongside such famous prehistoric animals as T. rex and Triceratops, in the Late Cretaceous of Montana, has always been a bit-player when it comes to depicting life in the very last couple of million years before the extinction of the non-avian dinosaurs. Its more illustrious contemporaries tend to hog the limelight somewhat. However, the scientific description of a nearly complete skull and jaws of what has been identified as a juvenile Pachycephalosaurus, might just have revealed a surprising side to this peaceful plant-eater. The teeth in the front of jaws are triangular and pointed, reminiscent of the dentition of a meat-eating dinosaur. Could palaeontologists have got Pachycephalosaurus wrong? A reconstruction of the fossil skull of the juvenile Pachycephalosaurus that has Theropod-like teeth in the front of the jaws. In a presentation made at the annual meeting of the Society of Vertebrate Palaeontology held in Albuquerque, New Mexico, Mark Goodwin (University of California Museum of Palaeontology) and David Evans (Royal Ontario Museum), described a near complete juvenile Pachycephalosaur skull from eastern Montana. The back of the jaws contained the broad, leaf-shaped teeth which seem well suited to herbivory. It had been assumed that the teeth in the front of the jaws (premaxilla and the anterior portion of the dentary, immediately behind the predentary), were the same shape. However, until this fossil specimen was found, no record of the front teeth of these dinosaurs existed. Palaeontologists may have to re-think their views on the diet of this member of the Hell Creek Formation biota. The sharp, blade-like triangular teeth located at the front of the mouth seem adapted to ripping and tearing flesh. A close-up view of the teeth in the premaxilla (upper jaw) and the anterior portion of the dentary (lower jaw). Triangular Theropod-like teeth have been identified in a juvenile Pachycephalosaurus. Pachycephalosaurus is the largest member of the Pachycephalosauridae family to have been scientifically described and notwithstanding a cameo appearance of a jail-breaking Stygimoloch in the recent “Jurassic World – Fallen Kingdom” movie, perhaps the most famous. However, not a great deal is known about Pachycephalosaurus and other bone-headed dinosaurs. Fossil remains tend to be very fragmentary and most species have been named from quite scrappy remains and then you have those amazing skulls to consider. A lithe Pachycephalosaurus dinosaur model. Pachycephalosaurus (P. wyomingensis) is the largest known member of the Pachycephalosauridae with an estimated body length of 4.6 metres. Several species have been named based on the shape and cranial ornamentation associated with those thickened skulls. The thick bone may resist erosion and provide palaeontologists with some fossil bone to study, but it has been suggested that the skulls of these dinosaurs changed dramatically as the animal grew. So much so in fact, that a number of academics, including Mark Goodwin, have published scientific papers that cast doubt on the validity of many Pachycephalosaur species. For example, palaeontologists such as Goodwin have put forward evidence to suggest that both Dracorex and Stygimoloch are not distinctive species, the fossils ascribed to these two genera could represent juvenile Pachycephalosaurus specimens. It seems, just like many other types of Late Cretaceous Ornithischian dinosaur, the Pachycephalosaurs underwent extreme changes to the shape of their heads as they grew up. Such changes in cranial morphology have resulted in the establishment of several species that may actually just represent examples of the same species but at different growth stages. It has been proposed that the cranial ornamentation and skull shape of Pachycephalosaurs changed as these animals grew and matured. This can cause confusion when trying to identify species. To complicate matters, Pachycephalosaur fossil material covers a period of approximately 2 million years. Over this timescale, these animals evolved and their skull morphology changed, thus, further blurring the lines between different species and fossils of the same species but at different levels of maturation. It would be difficult to confirm that Pachycephalosaurus also ate other animals as well as plants, but not impossible. Only one jaw fossil with the front teeth in situ has been found, so scientists don’t know whether the diets of these dinosaurs changed as they grew. Perhaps, young Pachycephalosaurs were omnivorous, whilst when fully grown, adults tended to consume plants rather than other animals. The rib cages of those genera which have a more complete fossil record, suggest that these bipeds had large guts, this would indicate a digestive system adapted to processing vegetation. Professor Philip Currie (University of Alberta), who also attended the Society of Vertebrate Palaeontology meeting, has proposed that studying carbon isotopes preserved in the tooth enamel might provide further evidence relating to diet. In addition, the many hundreds of examples of isolated, broken teeth from the Hell Creek Formation could be re-examined and checked for any potential affinities with the Pachycephalosauridae. Feeding traces from fossil bone could also yield more data in support of the idea that bone-headed dinosaurs ate meat. In the new for 2019 Wild Safari Prehistoric World (Safari Ltd) model range, there is going to be a model of an oviraptorid – Citipati (C. osmolskae). As a result, team members at Everything Dinosaur have been busy preparing for the arrival of these models by finalising the fact sheet that will accompany sales of this colourful dinosaur model. The fact sheet has just about been completed, it needs only to have the scale drawing added to it. Everything Dinosaur’s scale drawing of the oviraptorid Citipati (C. osmolskae). Our scale drawing is an approximation, the true size of this dinosaur is not known. It may have measured more than three metres long, although a body length of 2.5 metres is also possible. In the late spring (2018), a scientific paper was published that reported upon the finding of another oviraptorid specimen discovered in association with a nest. This specimen has been assigned to the Citipati osmolskae taxon, after all, fossils of this dinosaur are relatively common in the Ukhaa Tolgod region of Mongolia, where this new specimen was discovered. Intriguingly, a comparison of the upper arm bones indicates that this new example of dinosaur nesting behaviour represents an adult animal more than 10% bigger than the original Ukhaa Tolgod nesting Citipati osmolskae specimen (IGM 100/979). Estimating size for this member of the Dinosauria is therefore somewhat difficult. Although several examples of nesting/brooding behaviour have now been described (we think the total to date is five), no evidence for colonial breeding for these dinosaurs has ever been discovered. The Citipati fossil sitting on a nest. The fossil has been nick-named “Big Mamma”. The Wild Safari Prehistoric World Citipati replica is one of several new models in this range. Everything Dinosaur is hoping to have the first of the new for 2019 introductions, including the colourful Citipati replica, in their warehouse and available to purchase in December (2018). The Wild Safari Prehistoric World Citipati dinosaur model. The genus name for this oviraptorid comes from the Sanskrit for “funeral pyre lord”, a reference to a story from Buddhist folklore about two monks that were beheaded by a thief. These monks are frequently depicted as a pair of dancing skeletons surrounded by fire. The beautifully preserved Citipati specimens excavated from the red sandstones of the Djadokhta Formation, reminded the research team responsible for their study (Clark, Norell et al), of the dancing monks. The species name honours the Polish palaeontologist Halszka Osmólska (1930 – 2008), who pioneered research into Mongolian dinosaurs and made a substantial contribution to our understanding of Theropoda from the Upper Cretaceous deposits of Mongolia. The fossilised remains of a large flying squirrel unearthed at a landfill site in north-eastern Spain (Catalonia), has helped researchers to re-write the family tree of the Sciuridae family. Estimated to have been around one metre in length (including tail) and weighing up to 1.6 kilograms, the newly described squirrel species named Miopetaurista neogrivensis is around the size of the largest flying squirrels today, the Chinese giant flying squirrel (Petaurista alborufus). Its fossils show that the flying squirrel body plan has not changed for millions of years. A life reconstruction of the giant prehistoric squirrel Miopetaurista neogrivensis. The fossils, including most of the skull and jaws from a single individual, were discovered in 2002, when alterations were being made to the landfill site. At first, it was thought that the long, thin bones represented a primate, as simian fossils are known from these Miocene-aged deposits. Once the block of stone containing the fossil material had been removed and work had started to clean and prepare the bones, it soon became clear that the fossils represented a super-sized rodent. The key to identifying the specimen as a flying squirrel came in the discovery of the specialised wrist bones (pisiforms) which are unique to flying squirrels. These bones attach to a spur of cartilage that supports the skin membrane (patagium), that allows these arboreal specialists to glide. Once a pisiform bone had been identified in the specimen, it became clear to the research team that these fossils represented a flying squirrel. The fossils, dated to approximately 11.6 million years ago (Serravallian to Tortonian faunal stage of the Middle to Late Miocene), are very similar to the skeletons of living flying squirrels. Miopetaurista neogrivensis, is the oldest flying squirrel fossil found to date that has a modern-looking anatomy and it shows that these mammals have remained almost unchanged for nearly 12 million years. The fossilised bones and teeth of the Miocene flying squirrel Miopetaurista. This Spanish fossil discovery has helped palaeontologists to redraw the evolutionary tree of the squirrel family. That branch of the Sciuridae that led to modern flying squirrels must have diverged many millions of years earlier than previously thought. This spilt is now believed to have occurred sometime between 31 and 25 million years ago. The phylogeny of the flying squirrels has been revised after the description of Miopetaurista neogrivensis. The researchers identified Miopetaurista neogrivensis as sister taxon of the living Petaurista taxon following an in-depth Bayesian statistical analysis that looked at over 100 anatomical characteristics in 38 taxa. The team were also able to plot key periods in the evolution of these mammals and link them to incidences of environment and climate change such as the mid-Miocene climate optimum (global warming) and the onset of Arctic glaciation (global cooling). Flying squirrels today are globally distributed, but most species are found in Asia. It is likely that, just like its extant descendants, Miopetaurista neogrivensis was probably nocturnal and very much at home in its sub-tropical forest environment. It is not known what this ancient flying squirrel ate, today’s flying squirrels have a variety of feeding behaviours, however, Miopetaurista was probably omnivorous, feeding on nuts, fruit and insects. Spain in the Middle Miocene. Archaeorhynchus spathula – Lungs in an Ancient Bird Fossil? Modern birds have a very efficient respiratory system. Their lungs are much more efficacious than those of mammals. However, scientists are not sure when and how this breathing system evolved. It has been suggested that the origins of the bird’s respiratory system, complete with air sacs and the ability to stop de-oxygenated air mixing with oxygenated air as it is expelled from the lungs, is one anatomical trait inherited from their dinosaur ancestors. Writing in the academic journal the “Proceedings of the National Academy of Sciences”, a group of international scientists claim that the fossilised remains of an Early Cretaceous bird breathes new life into the evolution of the bird lungs debate. The main slab showing the fifth specimen of Archaeorhynchus spathula to have been described. Palaeontologists have identified what might be evidence for avian lungs as well as a pintail on this ancient bird. A study of the slab and counter slab representing the fossilised remains of a prehistoric bird (Archaeorhynchus spathula), suggests that, in this remarkably complete specimen, remnants of the animal’s soft tissues including internal organs such as the lungs could have been preserved. Using scanning electron microscopy, the research team, including members of the Beijing based, Institute of Vertebrate Palaeontology and Palaeoanthropology (IVPP), identified what could be evidence of paired lungs. The structures identified by the team suggest that Archaeorhynchus had a respiratory system capable of handling the large amount of oxygen required to sustain powered flight. Although, the conclusions drawn in the scientific paper have been questioned by several academics, if these are lungs, then it indicates that physiological adaptations in Aves came before changes in their skeleton during the evolution of anatomically modern birds. Counter slab of Archaeorhynchus spathula specimen interpreted as having lung preservation. The dotted outlines mark the location of organs (paired lungs and the stomach). Archaeorhynchus spathula is one of a number of bird genera known from the Lower Cretaceous Jiufotang Formation (China). Copious amounts of gizzard stones associated with this and the previous specimens suggest that these primitive birds were probably vegetarian. They form part of a rich prehistoric fauna known as the Jehol Biota. In total, five specimens have been described to date but this fossil, consisting of a crushed specimen represented by a slab and counter slab, is the most complete. Numerous feathers and traces of plumage can be made out and the researchers report that Archaeorhynchus had a pintail, a feature previously not seen in Mesozoic birds. A. spathula has been classified as a basal member of the Ornithuromorpha, a group distantly related to today’s birds and one that possessed a mix of ancient and more modern anatomical features. This fascinating fossil described as looking something like “road kill” by one observer, might have allowed palaeontologists to catch a glimpse of a stage of bird evolution where an advanced pulmonary system had evolved yet the skeleton lacked the adaptations seen in extant birds to permit efficient powered flight. At Everything Dinosaur, we have had lots of interest already from customers, social media followers and blog readers asking about new for 2019 models from Papo. We are not able to publish this information as yet, it remains embargoed. However, when we can, we will put up information and pictures, all part of our plans to inform people about what is new and upcoming in terms of 2019 model introductions from manufacturers next year. In the meantime, it is sensible to focus on those models and figures that are being withdrawn and are going out of production. Papo will be retiring two figures from their “Les Dinosaures” range next year, ironically neither of the models represent a dinosaur. 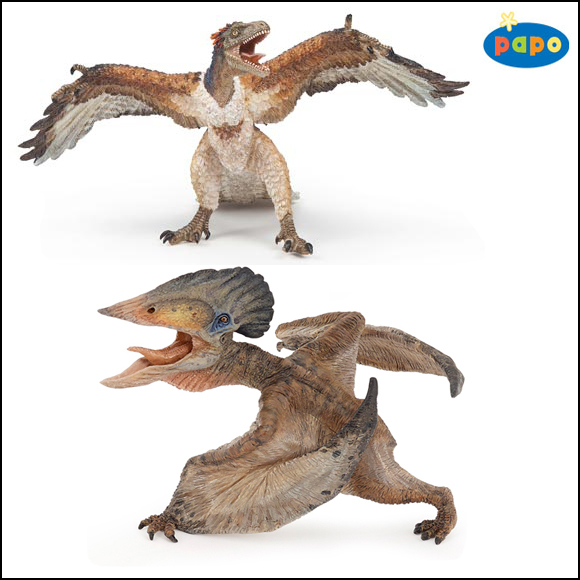 Papo model retirements 2019 – Archaeopteryx and Tupuxuara. Both these models represent animals from the Mesozoic that were capable of powered flight. Of the two, palaeontologists believe that the pterosaur, Tupuxuara was probably more confident in the air. Some of the latest research on the enigmatic “Urvogel” suggests that Archaeopteryx was actually quite a poor flier. Whatever their volant abilities, both these figures are being retired and are now out of production. However, thanks to Everything Dinosaur collectors and model fans are being pre-warned about their withdrawal. There is still time to add these two models to your Papo figure collection. The Papo Archaeopteryx figure was introduced in 2014 and at the time of its introduction, it received a lot of positive feedback as representations of Archaeopteryx lithographica were, if you pardon the pun, a bit thin on the ground. Sadly, after nearly five years, this model has flapped its wings for the last time and has been officially withdrawn. A close view of the head of the Papo Archaeopteryx model. At the time of this model’s introduction, Everything Dinosaur published several reviews of this figure including a video review. These releases have been seen thousands of times. It is always a pleasure to see more models representing the Pterosauria being introduced, so the loss of the Papo Tupuxuara is a big blow. 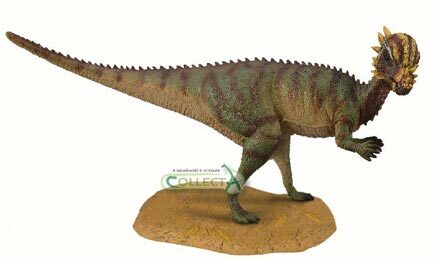 This figure was only introduced in 2015, alongside the Papo young Apatosaurus model. Three species of Tupuxuara have been named to date, the first being described in 1988. These pterosaurs are synonymous with Lower Cretaceous sediments found in north-eastern Brazil. The head of the Papo Tupuxuara pterosaur model. The diet of this large Pterosaur from the Lower Cretaceous of Brazil remains uncertain. One of the reasons suggested for the withdrawal of the Papo Tupuxuara figure, is the difficulty encountered when trying to pronounce the name of this flying reptile. Tupuxuara was named after a spirit referred to within the culture of the local Tupi people of north-eastern Brazil. Tupuxuara is pronounced “Too-pooh-hwar-ah”.